There are some beauty products that just have that wow factor. Directional and thoughtfully formulated, these superstars break through categories, set new records and eventually become the stuff of beauty legend. One such hero is Koh Gen Do’s Cleansing Spa Water. Introduced a decade ago before micellar water was trending, this game-changing beauty liquid had the unique ability to make heavy, greasy makeup and even permanent ink disappear in an instant. 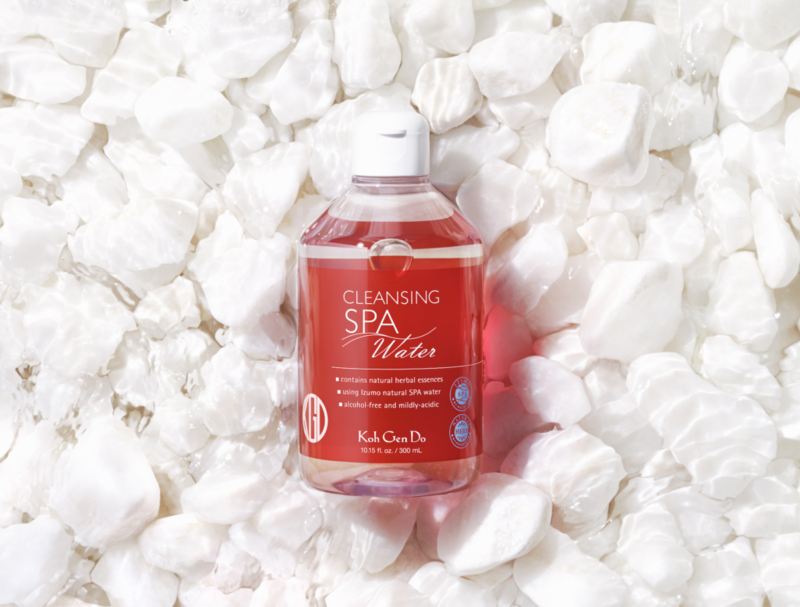 A fast favorite of celebrities, makeup artists, and consumers in Asia, the US, and basically the whole world, The Cleansing Spa Water, and its celebrated sister products, have since gone on to sell millions of units. Part of the magic, to be sure, is Koh Gen Do’s decision to constantly update the formula, improving it ever so slightly in each iteration. Pairing the newest technological r&d innovations with celebrated Asian skincare ingredients like white birch sap and mineral-rich thermal water sourced from Japan, the blend may look and feel like water, but it behaves like anything but. 1. Can you share a bit about the creation of the Koh Gen Do Cleansing Water? What was the inspiration? How did it come to be? During an excursion to Paris during fashion week, our Brand Director, Megumi Setoguchi, was inspired by the quick changes of both fashion and makeup on the runway. Megumi worked 4 years innovating the signature blend of Cleansing Water to be perfect for everyday quick makeup removal – gentle on and off the runway, TV and film stages around the world. 2. When was the Cleansing Water introduced to the market? Was it popular right away or did it take some time for customers to understand? 2018 marks the 10th anniversary of the signature blend of thermal mineral and botanical Cleansing Water launch in Japan; along with Koh Gen Do’s debut in the US market. In 2008, Koh Gen Do wowed audiences at IMATS with demos of Cleansing Water as it easily removed permanent pen marks on the skin, as gently as using pure water. TV, print and films began using Cleansing Water to remove both every day and heavy, resistant makeup. The “Sons of Anarchy” series was one of our first customer and used Cleansing Water to remove the actors tattoo effects on set. Cleansing Water did not stay a secret for very long and consumers gravitated toward our unique and effective formula. Gentle, nourishing Cleansing Water leaves the skin feeling clean and fresh without any tacky or oily residue; no rinsing is needed after use. 3. Is this the brand’s best-selling product? Cleansing Water, including our travel friendly Cleansing Water Cloths, are one of our best-selling categories along with our Aqua and Moisture Foundation, which also have a very devoted following. Globally, millions of Koh Gen Do Cleansing Water products have been sold since its launch. 4. Micellar water is now seen in products from many brands, but can you kindly share a bit about what makes yours different? Were there many others when this particular product launched? Koh Gen Do emerged a decade ago and continued to evolve to the coveted formula of today. Koh Gen Do was one of the first brands to offer a micellar water with a unique formula which blends botanicals, thermal mineral water and six essential herbs. Our Cleansing Water is different in that we use the same amount of skincare ingredients in Cleansing Water as we do in all of our skincare products. Our technology allows the pH balance to remain consistent while the Cleansing Water supports your skin before, during and after a beauty regime. The Cleansing Water cloths are natural cotton, certified organic in Japan. They have a soft, yet sturdy, feel and are ample sized to cleanse the entire face with just a single cloth. 5. Customers often marvel at how water-like the formula is, yet how deep cleaning. Can you share a bit about how micellar water removes makeup and impurities from the pores? Micellar waters contain tiny spheres (micelles) of cleansing oil molecules suspended in a water solution. They are soft enough for the oils to disperse, yet attract and remove impurities like dirt, oil and makeup from the skin. Koh Gen Do’s Cleansing Water relies on Japanese mineral rich thermal waters known for their soothing, restorative properties. We blend white birch sap that is harvested for only 3 weeks every spring containing sugars (namely xylitol), proteins, amino acids, and enzymes; that combined with botanicals to effectively dissolve even stubborn waterproof makeup. Above and beyond, Koh Gen Do added 6 essential herbs to brighten and balance the skin. 6. Can you tell us a little about the Koh Gen Do brand. What is its ethos? The Koh Gen Do brand begins with beliefs of nourishing skincare to bring inner beauty and restore troubled skin. Manifesting our culture of beautiful skin, we added foundation products to enhance as an integral part of skincare. Just as our approach started with the skin so too did integration of mineral powder, which was unique in 1988. 30 years later, we have fine-tuned this approach, and in Japan we are a “base makeup skincare” brand. Base makeup includes skincare and also the foundation to protect the skin while enhancing it. Other makeup products are considered under color and not part of base makeup. Our ethos from the beginning remains as we walk mindful of earth, nature and our environmental impacts to the skin. We never added active ingredients to try to produce aggressive results for skin as we target the health of the skin first. Skin requires daily care, as the rest of our body does, and by doing this we support the inherent abilities of staying healthy and tapping inner beauty. Healthy skin is part of this system and can recover quickly from insults such as sudden dry weather, emotional upheavals that affect your system, even for nights you can barely wash your face. Our evolution continues with technology-based Macro Vintage products designed to repair, plump and ensure a glowing complexion at any age. Koh Gen Do has innovated basic sophisticated Color products which don’t follow the trend of fashion, but only what enhances the beautiful nature skin. If plum is the season’s trend color you may not find that shade in our line if we didn’t find the perfect plum that enhances the skin! 7. There is a lot of talk about not damaging the “skin barrier” when cleansing. How does that happen typically and how can it be avoided? The skin barrier, in scientific terms, refers to the Stratum Corneum of the skin which is the outermost layer (often called the horny layer). This is skin’s “brick and mortar” that keeps moisture in while keeping harmful irritants out. The bricks are the surface dead skin cells while the mortar is the lipids that keep it together. With other products, damage to the barrier can occur in many ways: harsh products that strip lipids, rough handling or rubbing of the skin, exfoliating with granular types products and harsh environments. 8. This beauty water is said to help balance your skin’s pH. Can you talk a bit about how it does that and how someone should know if they need to balance their pH? The skin has a thin protective layer called the acid mantle with an optimal pH of 5.5. On the pH scale 0 is most acidic, 7 is neutral and 14 is most alkaline. Skin’s PH is important to maintain as it protects the skin from outside irritants such as bacteria, allergens & environmental pollution while keeping moisture in. Enzymes that break down collagen are triggered at higher pH levels. Higher pH levels can also leave the skin vulnerable to accelerated aging, dehydration and sensitivity. 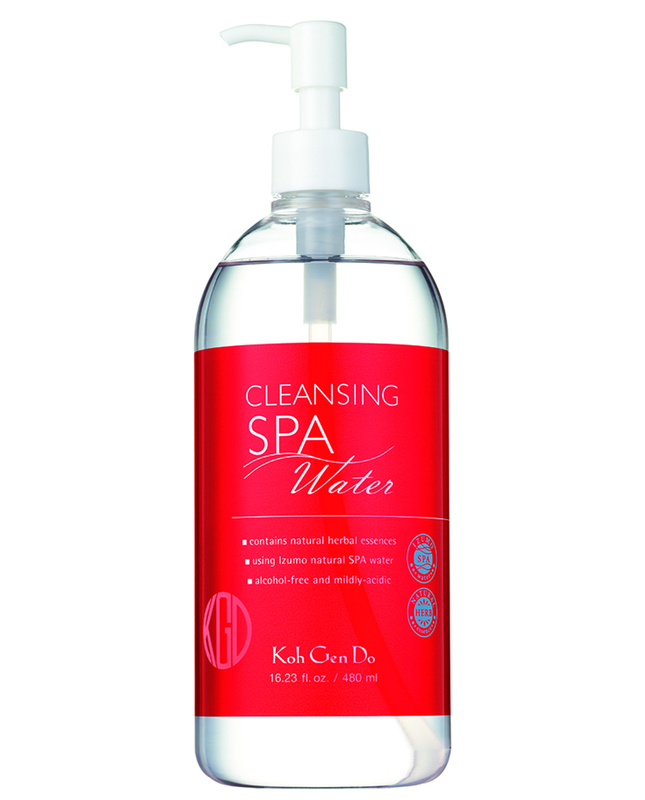 Koh Gen Do’s Cleansing Water products have pH at 5.3 to support and respect the acid mantle’s ideal pH range. 9. Should this be used instead of a regular face cleanser/makeup remover? Are there other ways that it can be used? Cleansing Water is always the step one-we need to remove makeup first! Use Cleansing Water to remove even the most stubborn or waterproof makeup including the eye area. Embracing the Japanese “double cleansing” method follow with a cream or lotion cleanser (like our Oriental Plants Cleansing Cream). 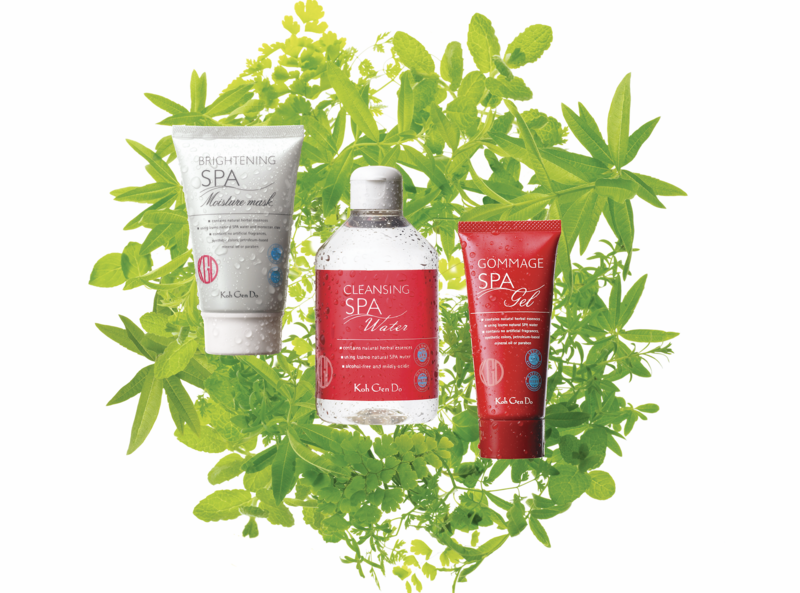 Lastly, ensure a supremely clean skin by using a foaming cleanser (such as Oriental Plants Soap, Oriental Plants Facial Wash or Spa Foaming Facial Wash). 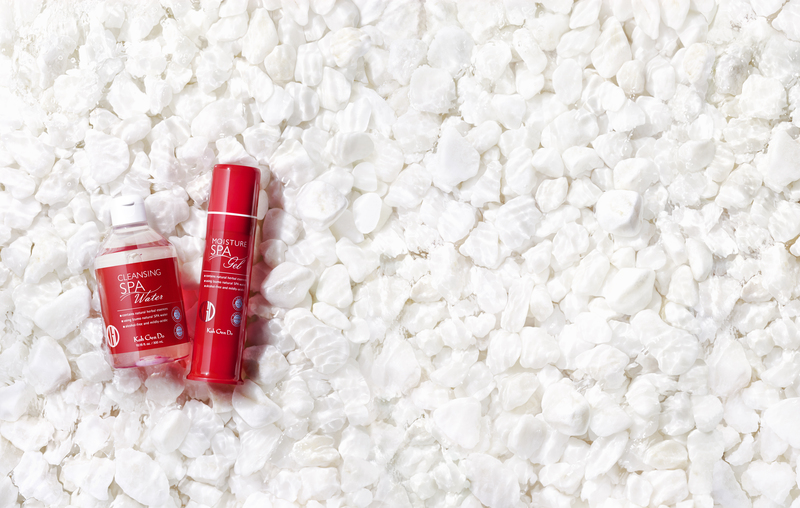 Insider secret: use our Pure Cotton with Cleansing Water. Splitting the layers of Koh Gen Do’s natural pure Cotton into 2 sheets after saturating with Cleansing Water so that you get double use of one cotton pad. 10. Is this safe even to use on the eyes? Is this made for any specific skin types? Cleansing Water is perfectly safe to use around the eye area. Sensitive skin types love soothing, balanced Cleansing Water. All skin types benefit! 11. Can you share about about the ancient Asian ingredients/inspiration that went into this product? Japan is the onsen, or hot spring, superpower of the world and boasts over 27,000 hot springs. Japanese thermal waters have been known to have an abundance of minerals along with skin softening benefits. We use the deep thermal water from Izumo, Japan as the base of this product. 12. What does the inclusion of lactic acid do? What is xylitol and what does it do for the skin? Lactic Acid falls into the AHA group but is gentler in the overall process. Uniquely used as a humectant and a gentle exfoliator in our Cleansing Water, it keeps cells hydrated while gently removing dead cells. Xylitol is naturally found in White Birch Sap that we use in our Cleansing Water. Xylitol is a sugar alcohol with humectant properties for the skin. 13. Can you give us any hint on future formulations/products that might be in the works? Any interesting trends or ingredients the brand is currently exploring? Koh Gen Do continuously innovates our research labs, exploiting the newest technology in delivering effective yet soothing skincare without irritation or over stimulation to the skin. Skin is already inundated with outside stimuli; restoring moisture and calming is one of the first benefits we achieve with Koh Gen Do products so that the skin can return to a healthy state. Koh Gen Do continues to expand our collections to support the needs of skin to thrive and enhance skins’ innate elasticity, hydration and radiance.